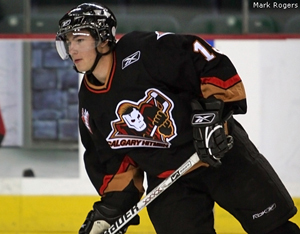 Brandon Kozun is the most dangerous scorer on the Calgary Hitmen. The Western Hockey League is the very picture of dichotomy. Its Eastern Conference is locked in a struggle for dominance, while the West’s playoff picture is quickly coming into focus. In the Prairies the Saskatoon Blades and Brandon Wheat Kings both have 84 points, with Saskatoon given the advantage with two games in hand. The Blades edge might be short lived as Brandon is rolling, earning points in the last 11 games. The Calgary Hitmen are in charge of the Central Division with 82 points and are white hot with eight straight wins. The Hitmen and Wheat Kings are hitting their stride at the right time of year, climbing the standings and taking momentum into hockey’s second season. They will decide who is the hottest team in the league Monday night as Brandon will visit Calgary. The Wheat Kings will have to keep a close eye on Brandon Kozun, whose 29 goals and 54 assists has the most points in the WHL. 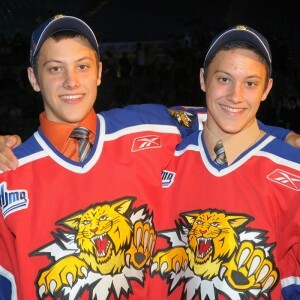 Brandon will also have to watch out for Tyler Fiddler who had two goals Friday night against the Prince Albert Raiders. Despite the success of the Blades, Hitmen and Wheat Kings, no team in the East has booked tickets to hockey’s second season just yet. Compare that knot to the WHL’s Western Conference where the playoff picture is almost completely sorted out. The Tri-City Americans, Vancouver Giants, Portland Winterhawks, Everett Silvertips and Spokane Chiefs have all clinched postseason spots. Further, on Saturday night Portland beat Prince George 3-1, eliminating the Cougars from contention. This means that of the 12 teams in the West, half already know how they’ll be spending the playoffs. The Seattle Thunderbirds will probably join Prince George soon, as they haven’t won a game since Jan. 9 when they, of course, earned a 3-1win over the Cougars. Since then it’s been 10 regulation losses and three in overtime. That leaves it up to the Kelowna Rockets, Kamloops Blazers and Chilliwack Bruins to claim the final three postseason berths. Alexandre Quesnel put the Val-d'Or Foreurs on his shoulders Friday night. Riley Brace and the Mississauga St. Michael's Majors were happy to take advantage of the slumping Oshawa Generals. Tyler Fiddler and the Calgary Hitmen continue to roll. 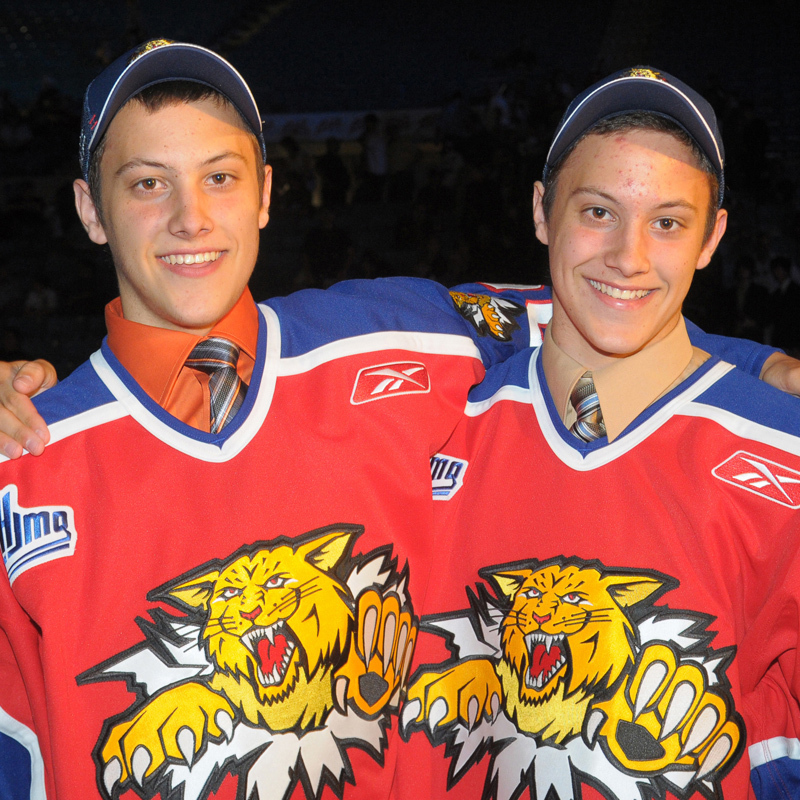 It was a career night for Felix Lefrancois and Petr Straka. When the Plymouth Whalers are in a tight game they know they can rely on Tyler Seguin. It's no surprise to Western Hockey League fans: the Prince George Cougars won't be making the playoffs. Kevin Poulin made history as the Victoriaville Tigres rolled to a win Sunday afternoon. Cody Hodgson is getting back into the swing of things. The Toronto Maple Leafs edged the Nashville Predators 4-3 Monday night, getting a late game-winning goal from young Phil Kessel, Brian Burke’s shiny acquisition, the cornerstone of the Age of Truculence. Since he started playing for the Leafs (about six weeks after the trade that brought him to Toronto from Boston) he has scored 15 goals and 13 assists, and is easily the best player on the Leafs. But I think the trade has been a terrible mistake. He doesn’t have enough help on the ice, he’s not a franchise player, and ultimately, the price was too high for Toronto. Don’t get me wrong, he is a great player. He finds open space, sees plays developing and makes intelligent decisions with the puck. He can score from anywhere in the offensive zone and demands that the other team cover him tightly, giving his teammates room to breathe. Unfortunately, his teammates don’t seem to know what to do with that space. As a result, opposing defences have begun to take advantage of the Leafs lack of depth. They have, as defensive coaches say, begun to cheat on Kessel. Defensive strategy relies heavily on reactive responses to an offence. Obviously, a good defence reacts to where the puck is, where the players are. But because Toronto does not have a strong secondary scoring threat, defences have taken to sealing off Kessel as soon as he’s on the ice. They know that should he pass the puck, the Leafs probably aren’t going to be able to score. Now, there are some players who would be able to overcome that, who could make the players around them better. The kind of players that only need to be identified by their surnames: Gretzky, Lemieux, Crosby, Ovechkin, Brodeur, Roy. Unfortunately, Kessel just doesn’t belong there. He’s a very good hockey player, but his shoulders aren’t broad enough to carry an entire franchise. And that, ultimately, is why trading two first round picks and a second round pick was too much for Kessel. That’s an awfully high price, jeopardizing the Leafs for the next five or more years. Frankly, I’m not sure that I’d trade that much for any of the franchise players mentioned above, let alone Phil Kessel. With the Leafs toiling near the bottom of the standings, the trade looks even worse. There’s a good chance that the division rival Boston Bruins landed themselves a top three pick that could mean Taylor Hall or Tyler Seguin, both quality players that would’ve helped the Leafs considerably, and at the rookie maximum salary instead of Kessel’s $27 million over five years. When there were rumours that Toronto was going to trade with the Boston Bruins, that Burke might land Kessel, a proven sniper, I was ecstatic. At last, the Leafs were going to start to turn it around. Most people I knew thought that too, but my good friend Ruben and my dad both held out, saying that it was a bad trade. It took me a while, but now I see it too. 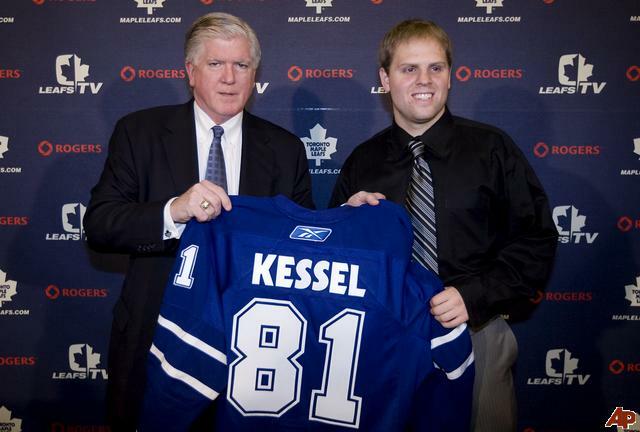 Phil Kessel is a quality player, but the price the Maple Leafs paid was way too high.